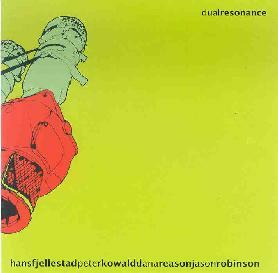 Hans Fjellestad/Peter Kowald/Dana Reason/Jason Robinson - "Dual Resonance"
Dual Resonance is a collection of 18 duo, trio and quartet recordings from southern California based improvisers Hans Fjellestad (piano & synthesizer), Dana Reason (piano), and Jason Robinson (tenor saxophone & electronics), and the late German bassist Peter Kowald. Half of the tracks were recorded during Kowald's U.S. tour in 2000, and the rest were recorded on January 1, 2003, after Kowald's unexpected death. "Dual Resonance" parts I-III are the quartet tracks, ranging from the almost frantic instrument attacks of part I, to the intense free-jazz of part II, and the much more subtle but elusively busy part III. I love performances like this in the free-improv world, in which the musicians so delicately but determinedly manipulate and dance about their instruments to create a beautiful blend of music and sound. Kowald also appears on trio tracks, one with Fjellestad and Reason and another with Fjellestad and Robinson, the latter ("Lunar Cycle") being one of the most expressive, varied and emotionally draining performances of the set. There are also two tracks each of duo performances with Kowald and his three collaborators, my favorite being the pairing of Kowald and Fjellestad on "Viscous Matter", a snarling, teeth bearing piano-bass duel. The remainder of the album consists of Fjellestad, Reason and Robinson performing as a trio. Highlights include "Axial Current", which starts off as a pure sonic chamber space ensemble attack, but the sax and piano soon begin a lazy parallel melody while a cosmic electronic line vibrates, swirls and drones. "Dual-energy X-Ray" is the spaciest performance of the set, with Fjellestad exploring freakland while Reason and Robinson color and supplement the electronic meteor shower with light jazz melodies. "String Theory" features sax and piano playing high energy but playful melodies while the electronics do their cosmic dance. It's a great combination of contrasts, the instruments and electronics seemingly at odds with one another, yet cooperating so harmoniously. "Manifold Runners" is similar, being a tasty blend of avant-jazz and thunderous electronics. And speaking of contrasts, both sax and piano shine on "Torus Knot" and "Free Anomaly", enhanced by the sound of waves washing up on the shore and other fun freaky electronics. In summary, this is yet another fine set from members of the vibrant southern California free-improv community. The performances are varied, with the marriage of compatible contrasts being what I found most exciting. Fjellestad is really doing inspiring things with electronics in the free-improv world and the more I hear from him the more intrigued I become with his work. Recommended to everyone into adventurous improvisational music, and fans of experimental electronics will find lots of interesting surprises here. For more information you can visit the Circumvention Music web site at: http://www.circumventionmusic.com. Visit the Hans Fjellestad web site at: http://www.hansfjellestad.com. Visit the Dana Reason web site at: http://www.danareason.com. Visit the Jason Robinson web site at: http://www.jasonrobinson.com. Contact via snail mail c/o Circumvention Music; PO Box 948609; La Jolla, CA 92037.